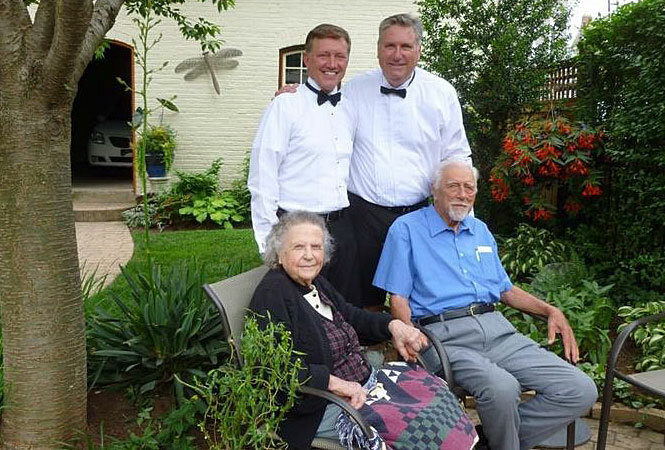 Chester Wenger (seated, right) and Sara Jane Wenger (seated, left) at the wedding of their son, Phil Wenger, (standing at right), and Steve Dinnocenti. LANCASTER, Pa. — A retired Mennonite pastor from Pennsylvania who has lost his credentials after officiating at his gay son’s wedding says he hopes the church will someday be more accepting of gays and lesbians. Lancaster Online reports that 96-year-old Chester Wenger of East Lampeter Township wrote in a Mennonite Church USA publication that he happily agreed to officiate at the June 21 wedding. “I know persons will accuse me for my transgression, but my act of love was done on behalf of the church I love, and my conscience is clear,” Wenger, former pastor at Blossom Hill Mennonite Church in Manheim Township, wrote in the online commentary. The credentialing commission’s decision followed a review process “that was experienced as mutually gracious and respectful,” he said. Wenger’s son, Phil, said he would never have requested that his father officiate at the simple backyard wedding if he had foreseen the repercussions. He said his father is worried that Mennonite Church USA may splinter over acceptance of gay members and pastors. “My father’s overriding passion has been to speak to his fellow Lancaster Conference Mennonites and to do that with a message of love and a desire to share his perspective after a long life of studying the Bible and looking at this very challenging issue in our community,” he said. Chester Wenger and his wife, Sara Jane, were missionaries for 17 years. He founded the Bible Academy in Nazareth, Ethiopia; was the first chairman of Ethiopia’s Meserete Kristos Church, now the largest Mennonite church in the world; and later directed home ministries and evangelism for Eastern Mennonite Missions in Salunga, Pennsylvania. Chester Wenger wrote in his commentary that he and his wife “grieved deeply” after a church leader excommunicated his adult son about 35 years ago without talking to him or his parents. After that, he said, he began meeting and reading the Bible with the parents of other gay children. Wenger said he is at peace with the credentialing commission’s action, but he prays for greater church acceptance of gays and lesbians. “We invite the church to embrace the missional opportunity to extend the church’s blessing of marriage to our homosexual children who desire to live in accountable, covenanted ways,” he said.